Can I Get a "51" Nib Exchanged? I recently bought a "51" on eBay. My handwriting is smallish, so I like F/XF nibs. I was advised to get a "51" made in the USA as the nibs are typically F.
The "51" I received was shipped very fast and is what I ordered (made in the USA). It even has the previous owner's name engraved on it which I like for some reason. The problem is that the pen writes way to "fat" for me. It is extremely smooth and I so want to like it, but it is just way too think a line for my writing style. I like the line width of my Hero 100 F nib much better and it is almost ideal for my writing style. I'm using Noodler's Black ink. The question is can I send my "51" and get either an F or XF nib put on it? I would send in writing samples with my Rotring 600 which is close to perfect and my Hero 100 which I consider ideal for camparisons to decide if F or XF (if both are options) are better for my style. I will try and put samples of my writing on here in the next couple of days in each of these pens. By the way, I love the "51". I love the idea of someone using this pen before me and I wonder about what all it wrote, where it's been, etc. Have you considered having a nibmeister, for example Richard Binder, to grind the nib to a fine? Another option is to ask if he has one for exchange. Btw, those wider 51 nibs are harder to find than those with fine nibs and are rather desirable. Edited by jeen, 26 April 2006 - 19:47. I agree with what Jeen said, the broader nibs are harder to find that the finer ones. Therefore you will find somebody to do an exchange for you with out too much problem. You could have the nib altered, but normally an exchange is a better option. Email a few pen repairers or put an ad up on the Marketplace, saying you want a swap, you never know. Okay, so here is a sample of my handwriting with my collection (4) of FPs. 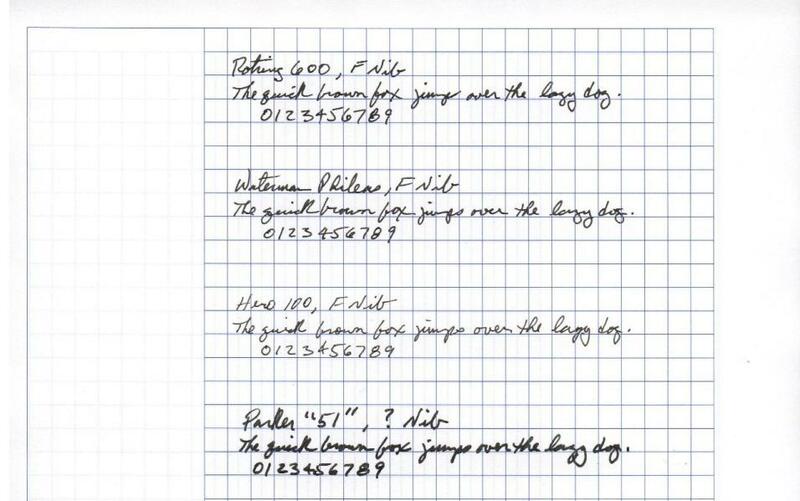 The grids on my handwriting sample are 1/4 inch grids. This gives you an idea of the size of my writing. You can see how thick the new (to me) "51" is compared to the other pens. This pen is too thick writing for me to use but I do want a "51". For those of you who have a "51", how do my other pens compare to a true F "51"? I believe this "51" is more a M/B instead of an F.
So, is my Hero 100 more of a F or XF on a "51"? Edited by Dadof8, 30 April 2006 - 17:44. My fine 51s look closest to the Phileas' line. The Hero looks EF to me. I would say that the nib is more like a US Medium rather than a F to me. Certainly the "51"s I have, that have a nib that I know is a Fine, are closer to the Rotring and the Waterman.